The theory of evolution by natural selection, first formulated in Darwin's book "On the Origin of Species" in 1859, is the process by which organisms change over time as a result of changes in heritable physical or behavioral traits. Changes that allow an organism to better adapt to its environment will help it survive and have more offspring. The theory has two main points, said Brian Richmond, curator of human origins at the American Museum of Natural History in New York City. "All life on Earth is connected and related to each other," and this diversity of life is a product of "modifications of populations by natural selection, where some traits were favored in and environment over others," he said. More simply put, the theory can be described as "descent with modification," said Briana Pobiner, an anthropologist and educator at the Smithsonian Institution National Museum of Natural History in Washington, D.C., who specializes in the study of human origins. The theory is sometimes described as "survival of the fittest," but that can be misleading, Pobiner said. Here, "fitness" refers not to an organism's strength or athletic ability, but rather the ability to survive and reproduce. "I can see no difficulty in a race of bears being rendered, by natural selection, more aquatic in their structure and habits, with larger and larger mouths, till a creature was produced as monstrous as a whale," he speculated. The idea didn't go over very well with the public. Darwin was so embarrassed by the ridicule he received that the swimming-bear passage was removed from later editions of the book. The story of the origin of whales is one of evolution's most fascinating tales and one of the best examples scientists have of natural selection. The last shore-dwelling ancestor of modern whales was Sinonyx, top left, a hyena-like animal. 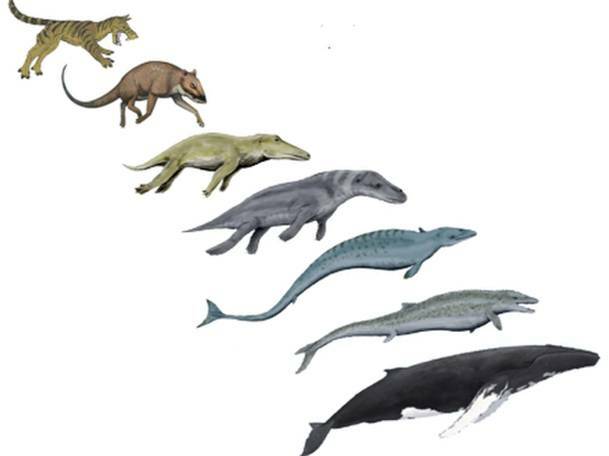 Over 60 million years, several transitional forms evolved: from top to bottom, Indohyus, Ambulocetus, Rodhocetus, Basilosaurus, Dorudon, and finally, the modern humpback whale. And we don't need a microscope to observe irreducible complexity. The eye, the ear and the heart are all examples of irreducible complexity, though they were not recognized as such in Darwin's day. Nevertheless, Darwin confessed, "To suppose that the eye with all its inimitable contrivances for adjusting the focus to different distances, for admitting different amounts of light, and for the correction of spherical and chromatic aberration, could have been formed by natural selection, seems, I freely confess, absurd in the highest degree." Darwin didn't know anything about genetics, Pobiner said. "He observed the pattern of evolution, but he didn’t really know about the mechanism." That came later, with the discovery of how genes encode different biological or behavioral traits, and how genes are passed down from parents to offspring. The incorporation of genetics and Darwin's theory is known as "modern evolutionary synthesis." The physical and behavioral changes that make natural selection possible happen at the level of DNA and genes. Such changes are called mutations. "Mutations are basically the raw material on which evolution acts," Pobiner said. Mutations can be caused by random errors in DNA replication or repair, or by chemical or radiation damage. Most times, mutations are either harmful or neutral, but in rare instances, a mutation might prove beneficial to the organism. If so, it will become more prevalent in the next generation and spread throughout the population. In this way, natural selection guides the evolutionary process, preserving and adding up the beneficial mutations and rejecting the bad ones. "Mutations are random, but selection for them is not random," Pobiner said. But natural selection isn't the only mechanism by which organisms evolve, she said. For example, genes can be transferred from one population to another when organisms migrate or immigrate, a process known as gene flow. And the frequency of certain genes can also change at random, which is called genetic drift. Even though scientists could predict what early whales should look like, they lacked the fossil evidence to back up their claim. Creationists took this absence as proof that evolution didn't occur. They mocked the idea that there could have ever been such a thing as a walking whale. But since the early 1990s, that's exactly what scientists have been finding. The critical piece of evidence came in 1994, when paleontologists found the fossilized remains of Ambulocetus natans, an animal whose name literally means "swimming-walking whale." Its forelimbs had fingers and small hooves but its hind feet were enormous given its size. It was clearly adapted for swimming, but it was also capable of moving clumsily on land, much like a seal. Modern whales propel themselves through the water with powerful beats of their horizontal tail flukes, but Ambulocetus still had a whip-like tail and had to use its legs to provide most of the propulsive force needed to move through water. In recent years, more and more of these transitional species, or "missing links," have been discovered, lending further support to Darwin's theory, Richmond said. Despite the wealth of evidence from the fossil record, genetics and other fields of science, some people still question its validity. Some politicians and religious leaders denounce the theory, invoking a higher being as a designer to explain the complex world of living things, especially humans. Mainstream scientists see no controversy. "A lot of people have deep religious beliefs and also accept evolution," Pobiner said, adding, "there can be real reconciliation." Evolution is well supported by many examples of changes in various species leading to the diversity of life seen today. "If someone could really demonstrate a better explanation than evolution and natural selection, [that person] would be the new Darwin," Richmond said. Charles Darwin, "On the Origin of Species by Means of Natural Selection, or the Preservation of Favoured Races in the Struggle for Life," 1859, p. 162. Michael Behe, "Darwin's Black Box," 1996. Charles Darwin, "On the Origin of Species by Means of Natural Selection, or the Preservation of Favoured Races in the Struggle for Life," 1859, p. 155. • ..... жылы Дарвин өзінің негізгі шығармасын - «Табиғи сұрыпталу арқылы өмірдің пайда болуы» жарыққа шығарады. • «Адам мен жануарлардын мінез–құлықтары» (....... ж.). Осы жұмыстар Ч.Дарвиннің жалпы теориясын адамның шығу тегі проблемаларын шешуде қолдануды ұсынады. Дарвиннің теориясында «адам маймылдан шықты» деп тұжырымдады. 2.Жаңа қолтұқымдар, іріктемелер жасайтын шығармашылық үрдіс. 2. Ч. Дарвиннің 1868 жылы жарыққа шыққан еңбегі ……………………………………………………………………. деп аталады. 3. Ч. Дарвиннің 1871 жылы жарыққа шыққан еңбегі ………………………………………………………………………. деп аталады. 1.ХІХ-ғасырдың І-ші жартысында Англияда жүзеге асқан қоғамдық-экономикалық өзгерістер. 2.ХІХ- ғасырдың І-ші жартысында жаратылыстану ғылымдарының даму дәрежесі (систематика, салыстырмалы анатомия, эмбриология). 3.ХІХ- ғасырдың І-ші жартысында ауыл шаруашылық практикасының даму дәрежесі. 4.Ч.Дарвиннің өмірбаяны және еңбектері.? 5. “Түрлердің шығу тегі” еңбегіндегі негізгі қағидалар?